Our kitchen had been remodeled a couple years before we moved into our Silicon Valley home 24 years ago. The demise of the microwave in the attached oven combo was the catalyst to get this project finally started. Construction took about 4 weeks. We did most of our cooking in our motorhome parked in our side yard but also had a small microwave and coffee maker temporarily set up in our dining area, along with a dish drainer between our washing machine and laundry tub in the garage. The side burner on the BBQ also came in handy. Like for many people, cost was a consideration for us. 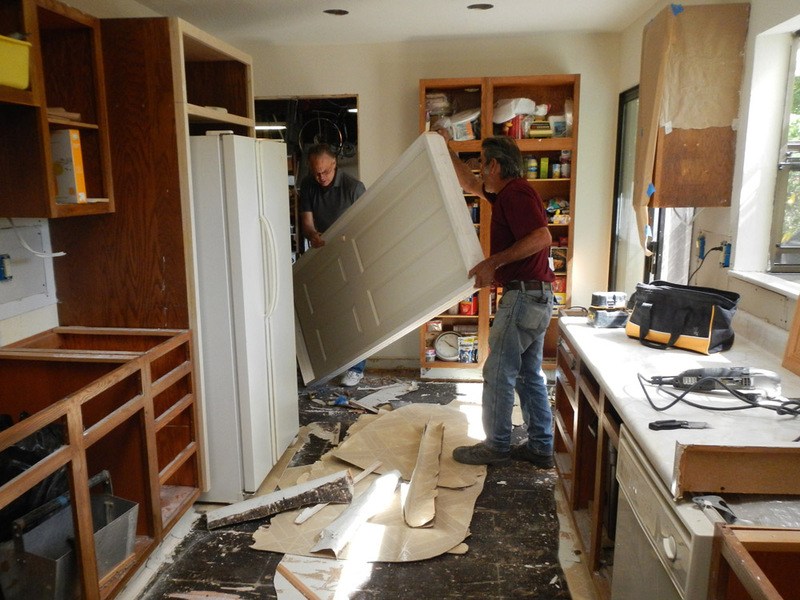 Instead of replacing the cabinets, we had them refaced since they were in otherwise good shape. 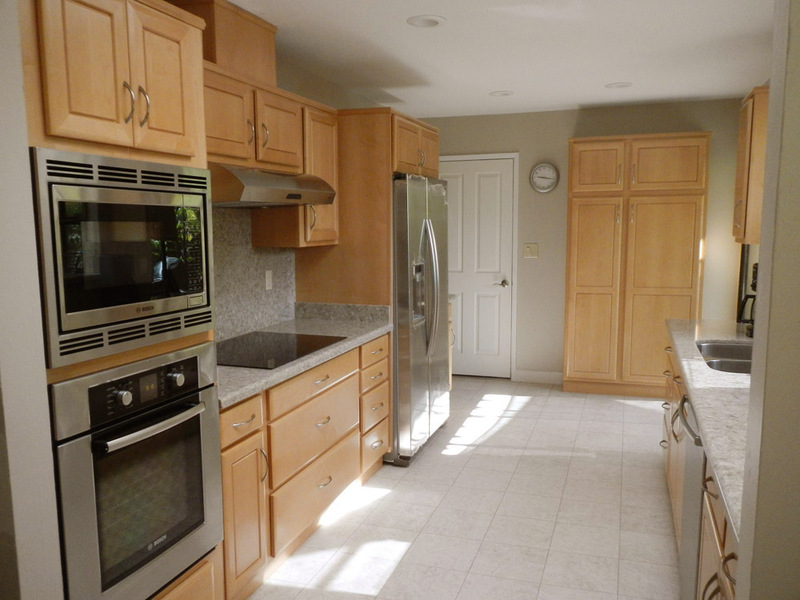 When we went into one of the total kitchen design places we were told that we could expect to spend about $60,000 for our 10'x16' remodel, a jolt from the $20,000 we had hoped. As it turned out, we actually spent a tad over 30. Instead of having someone take over with the design and construction from start to finish, Linda spent a lot of time researching photos online for the look she (we) wanted and then much, much more time reading reviews of appliances. We ended up getting a Bosch oven, induction cooktop, microwave and dishwasher, a Samsung refrigerator (all five from Sears), Insinkerator disposal and Kraus stainless sink (both from Amazon). Paavo Kallio and his brother Eric did a great job on our electrical work, adding 5 new circuits to replace our outdated 1953 wiring. The City of Sunnyvale electrical permit was $450. Several contractors we got bids from said they'd do it without a permit but we figured there would be less explaining to do when time came to eventually sell the house someday. The only other requirement of the permit was that we had to have smoke alarms in all three bedrooms and a combination smoke/carbon monoxide detector in the hallway. I was concerned that since we were removing the big fluorescent light fixture that our kitchen would be too dark. Eric assured me that the 14 watt LED lights (Commercial Electric 6 inch white recessed T85 from Home Depot @ $40) in 5 Halo cans wouldn't disappoint and he was right. The dimmer feature comes in handy sometimes. We also like the Crescent Slimlyte undercabinet lights. The ceiling needed to be patched up after the wiring was installed. At the same time as the old floor was being removed, Eric installed a new door into the garage. Our 11 year old Maytag refrigerator sold on Craigslist for $150 in less than an hour to an Asian woman who wanted it for one of her rentals. We asked $175 and she negotiated a discount in exchange for us not cleaning it..... fair trade! We are happy with Sean Weiby's painting (408-460-6251 in San Jose). The ceilings are "Swiss Coffee" eggshell (off-white) and walls "Indulgent Mocha" eggshell (both Behr paint from Home Depot). We'll have him back later to do the rest of the inside and outside of our house. 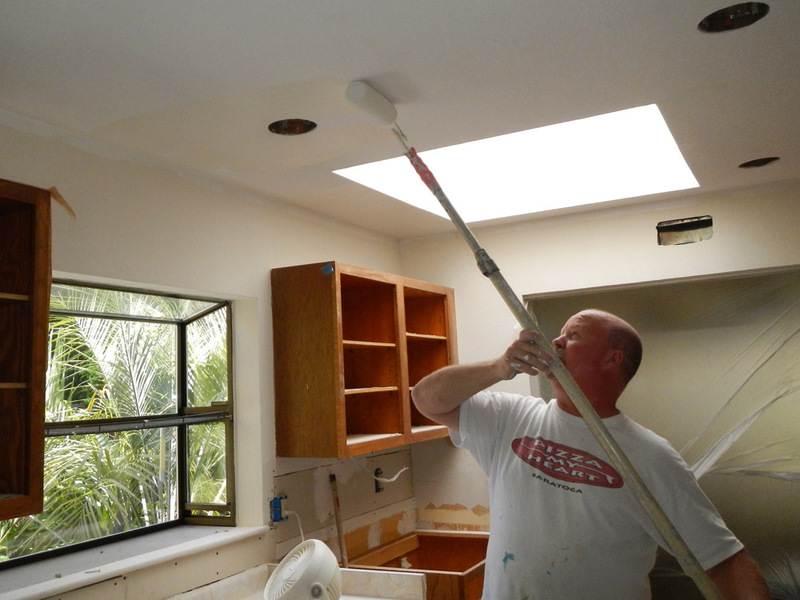 Eric Kallio in San Jose (408-398-5994) is the general contractor who coordinated the electrical, plaster and painting, as well as giving us suggestions on what and where to buy things at the best prices. He also installed all the appliances. 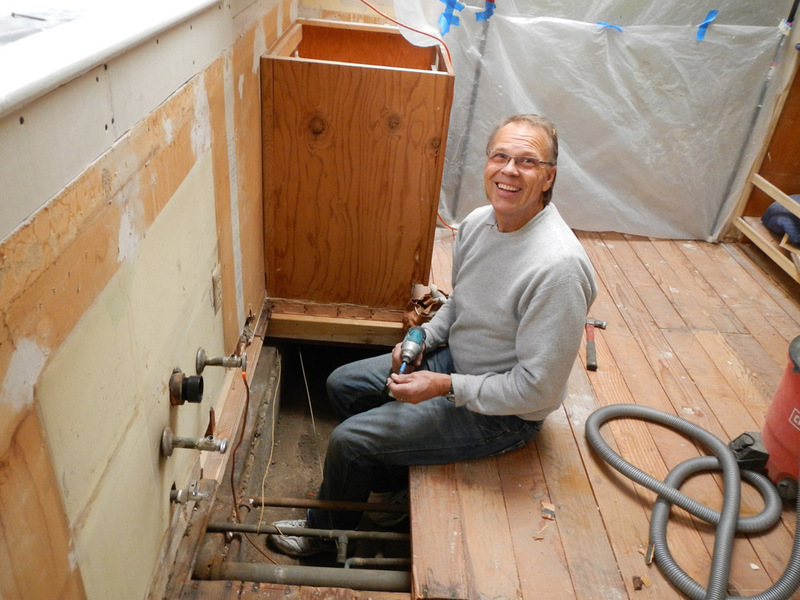 Here he's replacing some sub-flooring that had dry-rot from long ago. We highly recommend him! 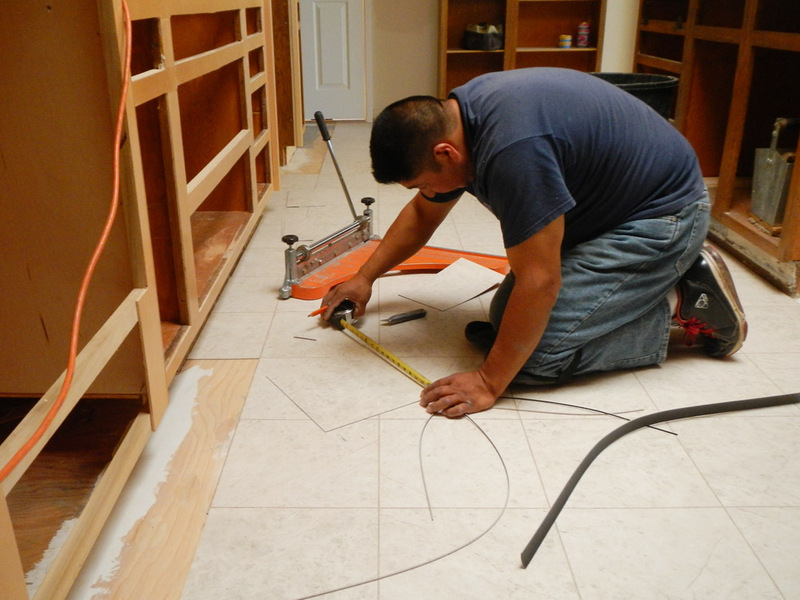 Here's Roberto installing our new floor (Karndean "Cara T98"). The old floor had been stripped down to the sub-floor and he added the plywood underlayment before installing the tile. Michael Dark was the helpful and patient salesman at MMM floors in Santa Clara 408-988-4661 x 501. Ken and Jodi Wallace own Monarch Solid Surface Design in San Jose (408-806-2602). Here he's putting in the finishing touches to the greenhouse window. 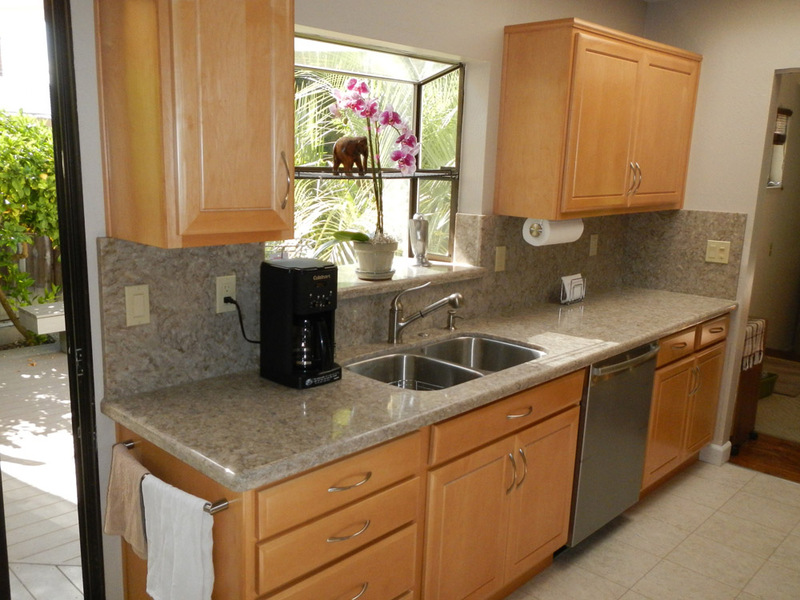 We used Silestone quartz (Quasar) on our countertops. Much of their task is education and he and Jodi were great at communicating in person, on the phone and via email. 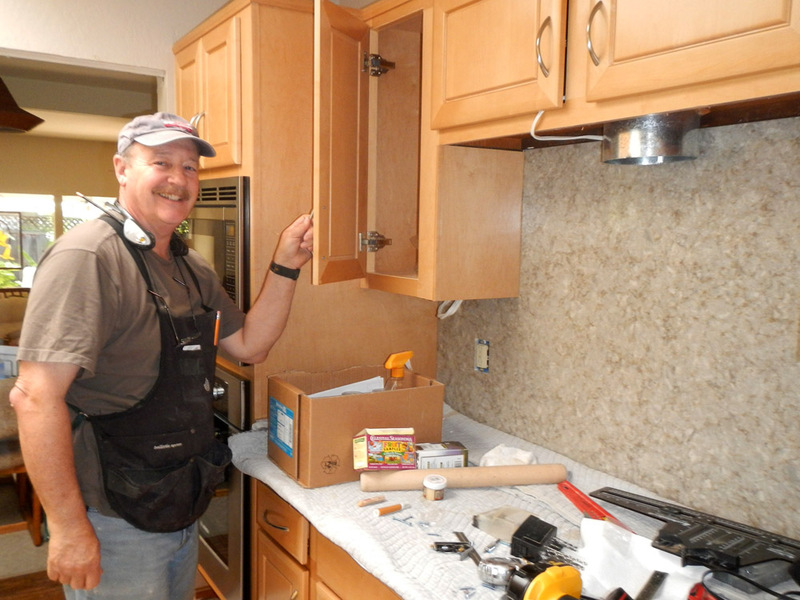 And then there's Mel, of Mel Barnhill Cabinetry in San Jose (408-441-1718). He did an amazing job refacing our cabinets, replacing the cabinet doors and pulls, and replacing our old drawers with new ones and updated hardware. He also does custom cabinetry from scratch. The compartment housing the new counter-depth refrigerator had to be widened a few inches and the attached cabinet to the right had to be shortened. 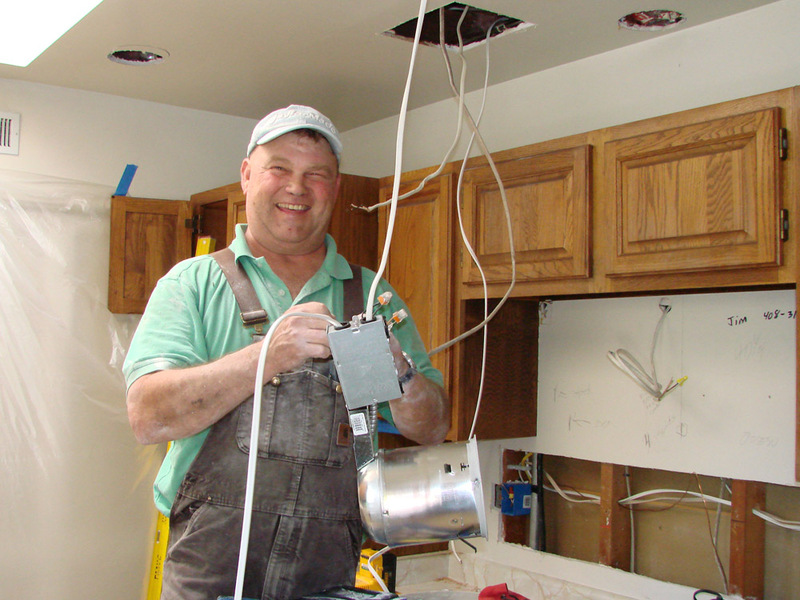 He's a great guy with incredible patience when having to deal with a homeowner kibitzer! We were really lucky to have a group of guys that work well together with a fair amount of laughter between them. Bottom line is that we couldn't be happier with the way the job progressed and turned out in the end! Appliances: University Electric, 1500 Martin Avenue, Santa Clara (408-496-0500) has an extensive showroom of appliances. We bought our Broan range hood there. 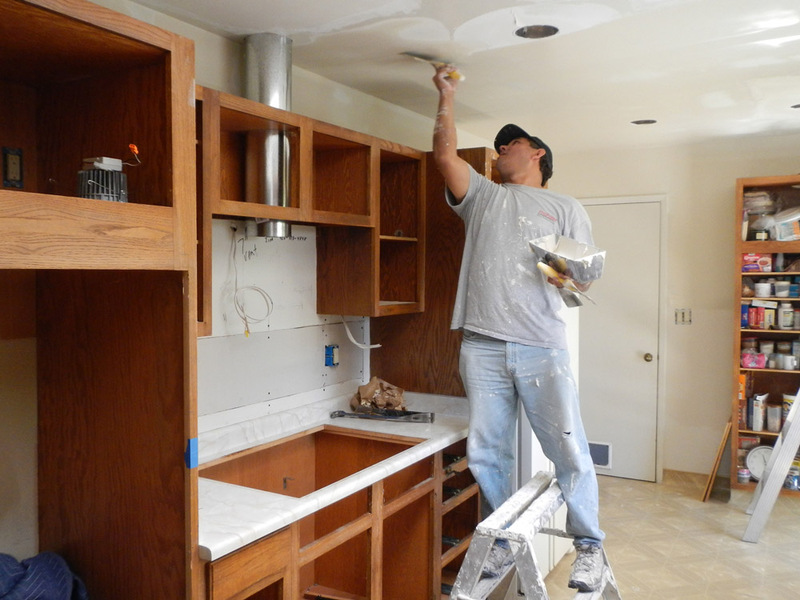 Your contractor may be able to help you get a "contractor price". Grohe Eurodisc Kitchen Faucet Review: We like the solid and smooth operation of our Grohe bathroom faucet and thought we'd feel the same way about the new Grohe Eurodisc kitchen faucet. 95% of the time we keep it in the spray mode but cutting the water volume down to a third would cause it to pop from spray to solid stream mode - very annoying to us! I thought it was simply defective and called Grohe customer service to get a replacement head but was told it was designed that way and there was nothing they could do to remedy it. It always defaults to the solid stream. I contacted Amazon through their chat line telling them the problem and that the faucet had an "inadequate online description". Even though it had been in use for a week and all the original packaging was gone, they emailed a pre-paid return shipping label and gave a full refund the same day they received it. That's one of the reasons I'm a loyal Amazon customer! BTW, the new Kohler Coralais K-15160-BN faucet works great and stays in the spray mode until we pop the button to change to stream. Door Hardware: The kitchen-to-garage door hardware (Schlage F51-ACC entry lever .... satin nickel) was from HandleSets.com. They're based in Chico, CA and shipped right away. Salesman was very helpful on the phone when we called for more information. Induction Cooktop: It's hard to believe that one could "love" a cooktop, but we both LOVE our Bosch induction cooktop! It got very high reviews online and I have to say it responds instantly, quicker than gas. We're very impressed how it works (it exchanges energy like your electric toothbrush in the cradle without wires). 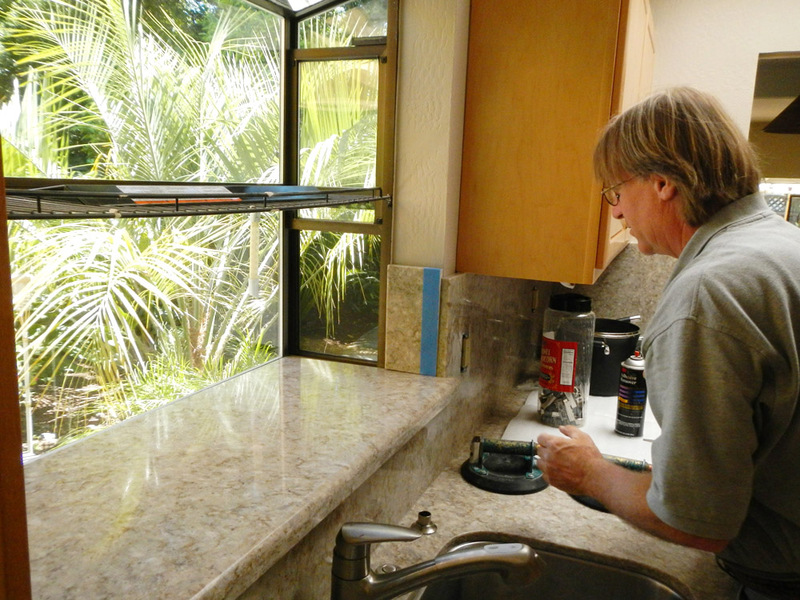 And having cleaned both gas and glass cooktops, it is super easy to clean, since it's smooth and doesn't radiate heat. It heats up only through contact with the hot pan, not the other way around. A magnet must stick to the bottom of a pan if it will work on an induction cooktop. We chose the Cuisinart Professional Tri-ply Stainless Cookware set.